In a few days, our country will celebrate Martin Luther King, Jr.’s birthday and a presidential inauguration. Whatever our political views, whatever our race or gender or religion or socioeconomic background, we can do our children a great service by talking to them about Dr. King’s vision of justice and peace, his commitment to respecting the dignity of every human being. I’ve found that parents, especially us white Americans, are reluctant to broach the subject of race relations with preschoolers or even elementary students. Ashamed of our country’s past afflictions, it’s as if we can pretend they never existed if we don’t talk about them. But child development specialists and sociologists (like Po Bronson and Ashley Merryman, authors of NurtureShock) have pointed out that children naturally notice differences in appearances, and that if we don’t have these conversations with them from an early age, they will begin to draw their own conclusions—and, even worse, begin to view the subject as taboo—which does nothing to advance our nation’s long and still arduous progression toward equality. And, let’s be honest, have you ever met a five or seven or ten year old that isn’t obsessed with the notion of fairness? For that matter, how many times a day do we as parents plead with our children, “Use your words!” (say, when said children yank something out of their sibling’s hands or push a peer on the school playground)? 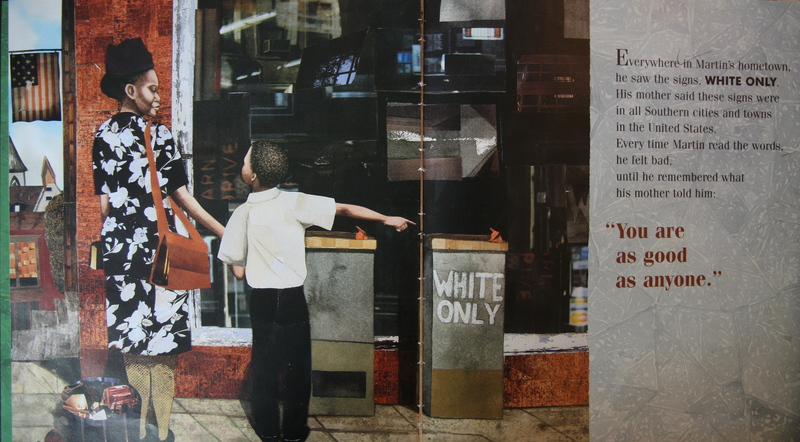 Doreen Rappaport and Bryan Collier seamlessly weave both the child-relevant themes of equality and “fighting with words and not fists” into Martin’s Big Words (Ages 5-12), a poignant but highly digestible introduction for children to the life and beliefs of Dr. Martin Luther King, Jr. Each page begins with a few sentences about a key point or event in Dr. King’s life and ends with a quotation that either influenced him as a child or that he used in one of his speeches as an adult. “You are as good as anyone,” his mother told him as a boy, when he would point to a “white only” sign outside a building in his hometown. Several times in the past few days, I have come across my son staring at the illustration of the young King standing in front of the sign; “it means he can’t go in there,” my son whispers in amazement when he catches me watching him. The book’s layout is arguably as influential as the content: with so much white space around each of the quotations, the book invites us to insert our own words—to discuss and elaborate on what we’re reading with our captive audience (How do you think it felt to walk to school or work in the pouring rain? How far do you think some of them had to walk? Do you think they ever wanted to quit? Why do you think they didn’t?). Of all the quotes, the one that resonates with my son the most is also the most famous: “I have a dream that one day in Alabama little black boys and black girls will join hands with little white boys and white girls as sisters and brothers.” I can see my son visualizing his own classroom, or the kids on the playground. The text goes on to point out that shortly after this last speech, the laws changed and the “white only” signs came down. “What do you think that means?” I ask my son. “I don’t know” comes his automatic reply. Then, after a pause, he adds, “That the world is now completely fair.” Well, no. Not yet. But one can dream—and really, that’s the point. Read my later post on 2014’s We Shall Overcome: The Story of a Song here. You are currently reading “Use Your Words” (MLK Jr. Style) at What to Read to Your Kids.